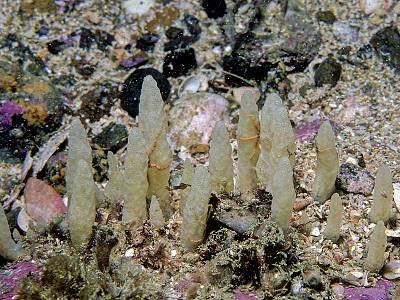 Description: The form of this sponge is very characteristic, it consists of a basal cushion buried in sand or gravel, from which project large conical, translucent papillae. 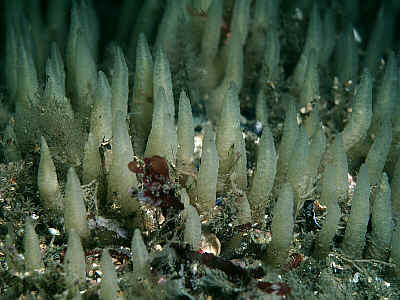 The surface of the papillae has a glassy, translucent appearance, through which vertical spicule fibres can be seen. A central core runs the length of the papillae, this is usually conspicuous in living material. The walls of the papillae are thick and robust with a roughened texture. Habitat: This species is very characteristic of, and appears to be restricted to bedrock/sediment interfaces, where upward facing bedrock or large boulders are overlain by clean coarse sand or gravel. 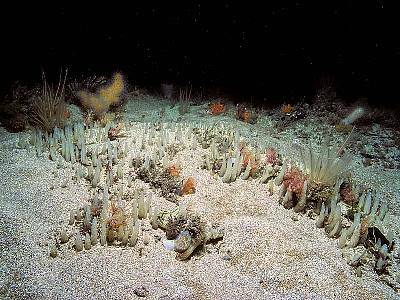 It is usually found in the circalittoral zone in areas exposed to moderately strong wave action or tidal streams. Distribution: Known recently from scattered localities on the western coasts of the British Isles. 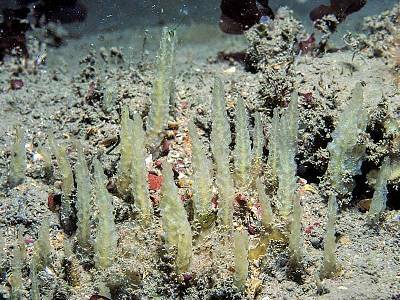 Similar Species: May be confused with Polymastia species, especially Polymastia penicillus. However, large conical papillae with a translucent, glassy appearance and visible central core are characteristic of Ciocalypta. Translucent, glassy appearance of papillae with a visible central core. Picton, B.E. & Morrow, C.C. (2016). Ciocalypta penicillus Bowerbank, 1864. [In] Encyclopedia of Marine Life of Britain and Ireland.